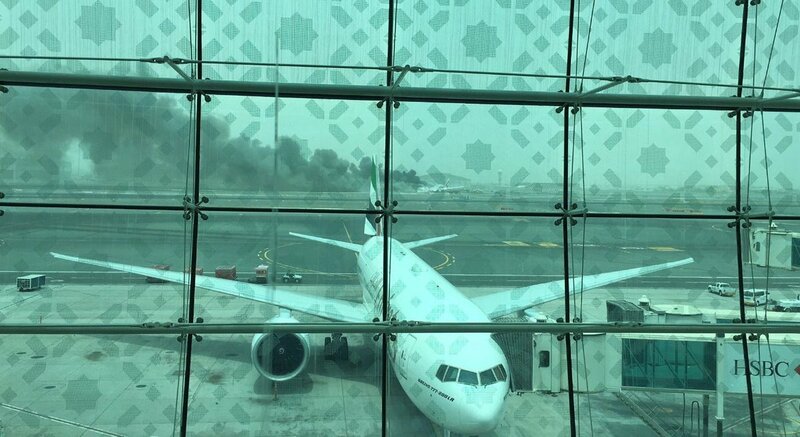 Just received a message from a friend at Dubai airport that the Emirates 777 had landed with the gear collapsing and would have caught fire? Any info anyone? Flight radar 24 showing pandemonium around DXB now, flights diverting all over the shop. The Flight didn't hold before landing. Twitter seems to think everyone got out alright. Let's hope so. There appears not to have been a 7700 squawk. Windshear looks to have been reported, whether that had any influence. From the video it looks like the plane held together pretty well. I just hope everyone made it out before the fire took hold. Up close Video from an emergency(?) vehicle. This brief video taken from a distance sppears to show a fuel explosion. 110/21 then 350/15 tempo with WS. Surely this has something to do with it, if they had a tech issue, probably time to divert. Video from an emergency vehicle. The emergency vehicle video seems to show the left wing inverted, ie the engine at the top of the wing? Hope everyone got out OK. A lot of slides deployed. the wing is still the right way up, and attached it seems, but the engine has detached and is sitting on the runway facing the wrong way. The engine intake is pointing toward the flaps. Wing definitely not inverted....engine broke away and ended on top of the wing. Mid air fire probably more than explains expedited emergency landing and inability to get the gear down. This might be one of the best possible outcomes in hindsight.